The Cape Fear Chapter of Surfrider Foundation is marking the first anniversary of the public discovery of GenX in the local water supply with Wilmington’s first Clean Water Week. The aim of the week of events, which will run from June 1 – 7, is to raise awareness about water quality in our region, specifically looking at the issues of offshore drilling and contaminants that could be found in local water. Cape Fear Surfrider is collaborating with four other local non-profits – Plastic Ocean Project, Cape Fear River Watch, NC Coastal Federation, and Cape Fear Sierra Club – to provide the free, family-friendly events. They include outdoor movie screenings, a hike around Greenfield Lake, and a panel discussion about emerging water contaminants in the Lower Cape Fear region, among others. 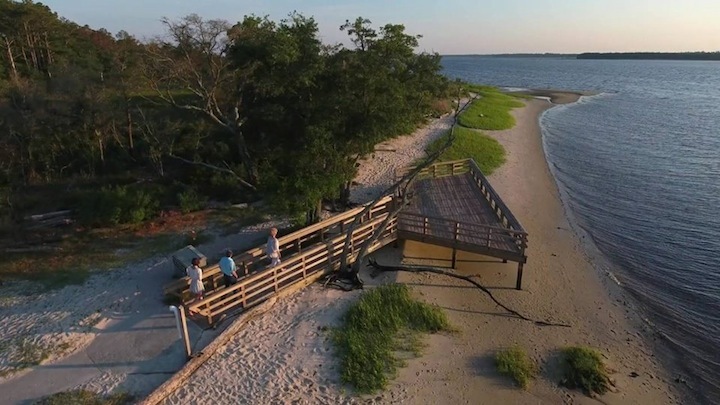 Friday, June 1 – Outdoor screenings of two locally-made films, “Shore Stories” and “If the Ocean Could Talk,” at Tidal Creek’s Community Deck at 5329 Oleander Dr. from 8-10 p.m.
Saturday, June 2 – Cape Fear River Watch Saturday Seminar at 617 Surry St. A free pancake breakfast begins at 8 a.m., with a talk by Dr. Roger Shew on the technical side of oil and gas extraction off North Carolina’s coast beginning at 9 a.m.
Sunday, June 3 – Cape Fear Sierra Club is leading a 4.5-mile paved hike around Greenfield Lake. Participants will explore the lake’s diverse ecosystem of plants and animals as well as collect trash along the way. The hike will start at 10 a.m. at the boathouse parking lot. Wednesday, June 6 – NC Coastal Federation is organizing a coastal cleanup at Carolina Beach State Park from 10 a.m. – 2 p.m. Volunteers, who will meet at the marina, will help conduct water quality testing and see what’s living in the estuary. Water bottles and weather-appropriate clothing are encouraged. Thursday, June 7 – Cape Fear Surfrider is hosting an informative panel conversation called “What’s in our Water?” with water quality experts. Attendees can bring their questions to ask the panel, which includes Dr. Jane Hoppin, Dana Sargent, Jim Fletchner, Dr. Larry Cahoon, Dr. Jamie DeWitt, and Dr. Susanne Brander. The event will be moderated by WHQR’s Vince Winkel and will take place from 6:30-8:30 p.m. at CFCC’s Union Station Auditorium, located at 502 N. Front St.